The objective of this study was to investigate and compare the adhering capacity of early colonizers of oral biofilm in a dynamic environment. The study was carried out by inoculating the early colonisers of oral biofilm (Streptococcus mitis, Streptococcus sanguinis and Actinomyces sp.) singly and in a mixture to the experimental pellicle in an artificial mouth (NAM) model for 24 h. This will form the respective 24 h single- and mixed-species biofilm. The bacterial population adhering to the experimental pellicle was determined and expressed as colony forming unit per ml (cfu mL-1). The adhered bacterial population was further confirmed using the Scanning Electron Microscope. It was found that S. mitis demonstrated maximum adherence (1153.33±132.46x104 cfu mL-1), followed by S. sanguinis (183.00±10.33x104 cfu mL-1) and by Actinomyces sp. (42.33±3.20x104 cfu mL-1). The adhering capacity of bacteria when present in a mixture of two-species was found to be reduced. However in a mixture of three species, it was found that the bacterial adherence was slightly increased. The difference in the adherence capacity of these bacteria to the experimental pellicle was found to be statistically significant (p<0.05). The results obtained in this study suggest that selected oral bacteria behave differently in a single- and mixed species biofilms. W.I. Wan Nordini Hasnor, A.R. Fathilah, M. Md. Yusoff and Z.H.A. Rahim, 2008. The Behaviour of Selected Oral Bacteria in Single- and Mixed-Species Biofilms. Journal of Biological Sciences, 8: 1001-1007. The bacteria present in the oral cavity are multispecies (Watnick and Kolter, 2000). The biofilm that is formed in the oral cavity can be of a group of bacteria, either of the same or mixed-species (Singh et al., 2006; Branda et al., 2005). Being formed in the oral cavity and comprised of oral bacteria (Marsh and Martin, 1999; Listgarten, 1999; Costerton, 1999; Mah and O`Toole, 2001; Branda et al., 2005; Singh et al., 2006) the biofilm is therefore, referred to as oral biofilm or dental plaque. An understanding of the adhering capacity of bacteria involved in the formation of the oral biofilm may give insight as to the bacteria that will survive and predominate in a single- and multi-species environment. The bacteria need to adhere successfully to an acquired pellicle on a tooth surface and subsequently produce extracellular materials (Fig. 1). Consequently, a suitable environment is created, destined favorable for the colonization of secondary colonizers which later can be one of the causative factors of caries development. The bacteria that are the first to colonize the acquired pellicle are known as early colonizers and among them is S. sanguinis (Fathilah et al., 1999; Bleiweis and Oyston, 1993; Maiden et al., 1992), Strep. mitis (Fathilah et al., 1999; Maiden et al., 1992) and Actinomyces sp. (Fathilah et al., 1999). Streptococci however, are the predominant organisms in the oral cavity during the initial stage of biofilm formation (Jefferson, 2004; Li et al., 2004). Earlier in vitro studies on the adhering capacity of the early colonizers (Fathilah et al., 1999; Fathilah and Rahim, 2003) were carried out in a planktonic environment. These studies utilized saliva-coated glass surface for the adherence of bacteria. The saliva-coated glass surface has been referred to as an experimental pellicle. In the planktonic environment, bacteria are grown in a static condition. This will allow for more time for the bacteria to adhere to the experimental pellicle. The bacterial population adhering to the experimental pellicle in the biofilm formed is a measure of the adhering capacity of the bacteria. In the oral cavity, saliva is continuously flowing at a rate dependent on the stimulus experienced by the salivary glands. Hence the multi-species bacteria in the oral cavity are not only affected by the type of saliva but also the environment in the oral cavity that is dynamic and not static. It has been reported that the bacteria like Strep. sanguinis behaves differently, being more hydrophobic in planktonic condition (Black et al., 2004). The adhering capacity of bacteria in a planktonic environment therefore may not correspond to that in a dynamic environment (Black et al., 2004; Ceri et al., 1999). The type of saliva is also said to affect the adherence of Strep. mutans to hydroxyapaptite beads, being inhibited by whole saliva and supported by parotid saliva (Carlén et al., 1996). It has been shown in earlier studies (Fathilah et al., 1999, Fathilah and Rahim, 2003) that employed planktonic environment and single-species biofilm, different bacterial species exhibited different adhering capacity. In this study, single- and mixed-species biofilms were allowed to develop in an artificial mouth (NAM) model, a model which simulates the environment of the oral cavity and the bacteria in the forming biofilm were exposed to a dynamic environment. The objective of this study was to investigate and compare the adhering capacity of bacteria (early colonizers) in single- and mixed-species biofilms formed in the model. Chemicals: All chemicals and reagents used were of analytical grade unless otherwise stated. Monobasic potassium phosphate and glycerol were purchased from Ajax Chemicals, Australia. Sucrose and sodium chloride were purchased from BDH Laboratory Supplies, England. Decon 90 was purchased from Decon Laboratories Limited, Sussex. 1,4-Dithio-DL-threitol solution was purchased from Fluka, Biochemika, Switzerland. Ethanol 95% was purchased from HmbG Chemicals. Potassium chloride and hydrochloric acid 37% were purchased from Merck, Germany. Brain Heart Infusion agar and Brain Heart Infusion broth were purchased from Oxoid Ltd., Hampshire, England. Acrodisc syringe filters (0.2 and 0.45 μm) were purchased from Pall Corp, United States of America. Chlorhexidine digluconate solution (20% aqueous) was purchased from Sigma-Aldrich, United States of America. Dibasic sodium phosphate anhydrous powder was purchased from Systerm®. Glass beads (3 mm diameter) were purchased from Merck, Germany. Whatman filter paper No. 1 was purchased from Whatman International Ltd., Maidstone, England. Bacterial strains: Clinical isolates of Streptococcus sanguinis, Streptococcus mitis and Actinomyces sp. were obtained from the Department of Oral Biology, Faculty of Dentistry, University of Malaya. The development of experimental pellicle and simulated oral biofilm: The development of experimental pellicle and simulated oral biofilm was carried out in an artificial mouth (NAM) model (Rahim et al., 2008). The NAM model consists of a glass chamber into which sterilized glass beads (10 pieces) were placed. The glass beads served as substratum onto which the experimental pellicle and simulated oral biofilm will develop. The glass chamber was then placed in water bath that serves as an incubator to maintain temperature that mimics body temperature. A reservoir with a capacity of 50 mL was connected to a peristaltic pump and the NAM model via rubber tubing. The reservoir is to contain respective fluids such as sterilized saliva, sterilized distilled water and bacterial inoculum. In this study, sterilized saliva was first allowed to flow into the NAM model for 2 min at a flow rate of 0.3 mL min-1 to coat the glass beads. This was followed by a flow of sterile distilled water to rinse off the excess saliva on the glass beads and the experimental pellicle present on the glass beads was then ready for bacterial inoculation. The bacterial inoculum (Strep. sanguinis, Strep. mitis and Actinomyces sp.) either as single- or mixed-species was pumped into the NAM model at a rate of 0.3 mL min-1 for 24 h to form a 24 h biofilm. For single-species oral biofilm, the bacterial species was inoculated into the system individually. The bacteria were inoculated into the system in a mixture of two bacterial species for a two-species oral biofilm (Strep. mitis-Strep. Sanguinis, Strep. mitis-Actinomyces sp. and Strep. sanguinis-Actinomyces sp.) and three bacterial species for the three-species oral biofilm (Strep. sanguinis-Strep. mitis-Actinomyces sp.). For control, a growth medium devoid of bacteria was used. The experiment was carried out in triplicates. The glass beads with the 24 h biofilm were processed for the following experiments. Three of the glass beads were used for the harvesting and determination of adhering capacity of the bacteria to the experimental pellicle, another four were used for the scanning electron microscopy study while the remaining three were kept aside as reserves to be used, when necessary. The harvesting of the biofilm on glass beads and determination of adhering capacity of the bacteria: The glass beads for the harvesting and determination of adhering capacity of bacteria were placed into separate microcentrifuge tube (1.5 mL), each containing 1.0 mL of Phosphate-Buffered Saline (PBS). The tubes were then sonicated for 10 sec and vortexed for 1 min to dislodge the bacteria that were attached to the glass bead. Following this, serial dilutions were carried out and 100 μL of the diluted bacterial suspensions from the 103 dilution was pipetted out and streaked onto Brain Heart Infusion (BHI) agar. The plates were incubated aerobically at 37°C for 18-24 h followed by the determination of viable count of bacterial colonies the next day. The adhering capacity of the bacteria was determined from the bacterial population (single- or mixed-species) dislodged from the 24 h biofilm on the glass beads and expressed as colony forming unit per mL (cfu mL-1). Preparation of samples for SEM viewing: The preparation of samples for SEM viewing was carried out according to the method described by Lagacé et al. (2006). The glass beads with the biofilm formed on them were fixed in glutaraldehyde (4%) in glass vials for one hour at room temperature. The glutaraldehyde was discarded and the glass beads were rinsed once with distilled water. The washed glass beads were then fixed in osmium tetraoxide (1%) and left overnight (14 h) in tightly capped vials at 4°C in the refrigerator. After 14 h, the vials were taken out from the refrigerator and left for 30 min at room temperature. The osmium tetraoxide (1%) was gently pipetted out and the samples were washed with distilled water for 15 min. The dehydration process was carried out by treating the samples with the ascending percentages of ethanol (10-100%). The samples were immersed in the different concentrations of ethanol for 15 min. The samples were then immersed in 100% ethanol twice to ensure that most of the water in the samples was eliminated. 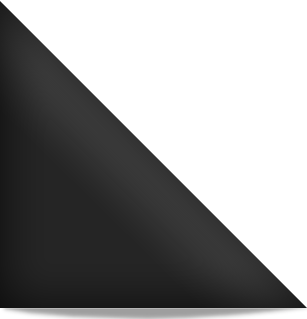 Gradual displacement of ethanol with acetone was then carried out (20 min each) using the following ratios (v/v) of Ethanol: Acetone (3:1, 1:1 and 1:3). Subsequently, the samples were immersed in 100% acetone for four times, 20 min each time, followed by Critical Point Desiccation (CPD) process. The samples were then mounted on metal stubs and coated with gold. After gold-coating process, the samples were ready for SEM viewing. Statistical analysis: All data obtained in the study were analysed using the t-test of SPSS software. Adhering capacity of bacteria in single-species oral biofilm: It was found that for the single-species biofilm formed over a period of 24 h, Strep. mitis demonstrated maximum adherence (1153.33±132.46x104 cfu mL-1), followed by S. sanguinis (183.00±10.33x104 cfu mL-1) and by Actinomyces sp. (42.33±3.20x104 cfu mL-1) (Table 1). The difference in the adhering capacity to the experimental pellicle between these bacteria was found to be statistically significant (p<0.05). Adhering capacity of mixed-species bacteria to the experimental pellicle: In Table 1, it was shown that the adherence of the mixed three-species of Strep. sanguinis-Strep. mitis-Actinomyces sp. (208.33±25.85x104 cfu mL-1) on the saliva-coated glass beads was the highest compared to biofilms of the mixed two-species (Strep. sanguinis-Strep. mitis, Strep. mitis-Actinomyces sp. and Strep. sanguinis-Actinomyces sp.). Two-species biofilms of the Strep. sanguinis-Strep. mitis and Strep. mitis-Actinomyces sp. showed lower adherence, 186.17±5.27x104 and 148.00±7.43x104 cfu mL-1, respectively. Minimum cell adherence was observed with the two-species biofilm of Strep. sanguinis-Actinomyces sp. (95.00±2.45x104 cfu mL-1). The differences in the adhering capacity of these bacteria in the formation of the various types of biofilms were found to be statistically significant (p = 0.000). Scanning electron micrographs: The single-species biofilm exhibits different characteristic between the different bacteria (Fig. 2). The bacterial mass of single-species biofilm containing Actinomyces sp. is the least compared to the other two bacteria. This confirmed the result with the bacterial population study. The Actinomyces sp. can easily be recognized as the rod shaped microorganisms in chain. In the mixed-species biofilm (Fig. 3), the bacteria seem to produce thread-like structures that appear to be denser in the two-mixed species biofilm that contain Strep. mitis-Actinomyces sp. and Strep. sanguinis-Actinomyces sp. and the thread-like structures are shown to be more abundant in the three-mixed species compared to the two-mixed species. The Actinomyces sp. in the mixed-species biofilms which are rod in shape appear to be fat. The adhering capacity of the different bacteria in single-species biofilm obtained in this study contradicted the observation reported by Fathilah et al. (1999). The discrepancy could be due to the difference in the system used to grow the cells. Fathilah et al. (1999) used a system where the cells were grown in planktonic state which is static. In this study, the bacterial cells were grown in a condition where nutrients are continuously supplied and hence, are not static. A clear difference with respect to the growth of cells while under the planktonic and continuous condition had been reported by Black et al. (2004) and Ceri et al. (1999). The different bacterial species in single-species biofilm possess different adhering capacities with Strep. mitis (11.53%) exhibited the highest adhering population and Actinomyces sp. (0.42%), the lowest. This indicates that the adhering capacity of bacteria is species dependent. When the bacterial species were inoculated in a mixture, the two-species biofilm (Strep. mitis-Strep. sanguinis, Strep. mitis-Actinomyces sp. and Strep. sanguinis-Actinomyces sp.) appear to have reduced bacterial adherence. This reduced adhering capacity observed could be due to competition for nutrients and spaces (Christensen et al., 2002) that may result in antagonistic reactions between the different species of bacteria (Tait and Sutherland, 2002; Kreth et al., 2005). It was also shown that the adhering bacterial population between the different mixed-species biofilms are significantly different (p<0.05). The mixed-species biofilms (Strep. mitis-Strep. sanguinis, Strep. mitis-Actinomyces sp. and Strep. mitis-Strep. sanguinis-Actinomyces sp.) exhibited higher bacterial population compared to the one without Strep. mitis. It appears that the Strep. mitis that does not produce extracellular substances in the absence of sucrose (Slots and Taubman, 1992) promotes the adhering of the other bacterial species in the mixed-species biofilm. The adhering capacity of Actinomyces sp. which is the least in single-species biofilm increases when present in mixed-species. This indicates that in a mixed-species biofilm, the presence of one bacterial species may influence the adhering capacity of another bacterial species. This phenomenon has been demonstrated by Palmer et al. (2003) who explained that there could be occurrence of co-aggregation and co-adherence among streptococci and Actinomyces sp. in early oral biofilm. The scanning electron micrographs further confirmed the results of the bacterial adherence study based on bacterial population which is expressed in cfu mL-1. The bacterial population seen in the micrograph is also the least with Actinomyces sp. which confirmed that the Actinomyces sp. has the lowest adhering capacity compared to the other two bacteria. The bacteria in single-species biofilm showed the usual individual characteristics, the Strep. sanguinis and Strep. mitis are cocci in shape. The Actinomyces sp. can easily be recognized as long, rod shaped microorganisms in chain. Thread-like structures were observed in the electron micrographs of the two- and three-mixed species biofilms but not in single-species biofilm. 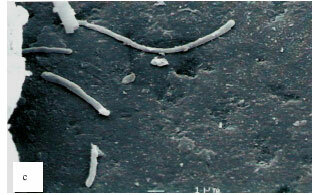 These thread-like structures appear to be denser in the two-mixed species biofilm that contain Strep. mitis-Actinomyces sp. and Strep. sanguinis-Actinomyces sp. and are shown to be in abundance in the three-mixed species compared to the two-mixed species This phenomenon may suggest that the presence of either Strep. sanguinis or Actinomyces sp. in the mixed-species biofilm contribute to the production of the thread-like structures. These structures could be produced as a result of stress that the bacteria may experience as a result of competition for nutrients and spaces (Christensen et al., 2002). The rod-shaped Actinomyces sp. in the mixed-species biofilms appeared to be short and fat. The adhering capacity of bacteria to the experimental pellicle and subsequently the bacterial population in the oral biofilm formed is species-dependent. It is also very much influenced by the bacterial species in the mixture and the environment in which the bacteria are growing. This suggests that the bacteria behave differently under different environment. The understanding of the adhering capacity or behaviour of bacteria in single- and mixed-species biofilms may be beneficial to research involving potential antibacterial agent against bacteria in oral biofilms. This study was supported by IRPA (Project No. 09-02-03-0197EA197) research grant from the Ministry of Science, Technology and Environment of Malaysia. Black, C., I. Allan, S.K. Ford, M. Wilson and R. McNab, 2004. Biofilm-specific surface properties and protein expression in oral Streptococcus sanguis. Arch. Oral Biol., 49: 295-304. Bleiweis, A.S. and P.C.F. Oyston, 1993. Adhesion and Cohesion Of Plaque Microflora: A Function of Microbial Fimbriae and Fibrils. In: Cariology for the Nineties, Bowen W.H. and A.L. Tabak, (Eds.). University of Rochester Press, New York, pp: 287-285. Branda, S.S., A. Vik, L. Friedman and R. Kolter, 2005. Biofilms: The matrix revisted. Trends Microbiol., 13: 20-26. Carlén, A., J. Olsson and P. Ramberg, 1996. Saliva mediated adherence, aggregation and prevalence in dental plaque of Streptococcus mutans, Streptococcus sanguis and Actinomyces sp in young and elderly humans. Arch. Oral Biol., 41: 1133-1140. Ceri, H., M.E. Olson, C. Stremick, R.R. Read, D. Morck and A. Buret, 1999. The Calgary biofilm device: New technology for rapid determination of antibiotic susceptibilities of bacterial biofilms. J. Clin. Microbiol., 37: 1771-1776. Christensen, B.B., J.A.S. Haagensen, A. Heydon and S. Molin, 2002. Metabolic commensalism and competition in a 2-species microbial consortium. Applied Environ. Microbiol., 68: 2495-2502. Costerton, J.W., 1999. Discussion: Introduction to biofilm. Int. J. Antimicrob. Agents, 11: 217-221. Fathilah, A.R., Y. Othman and Z.H.A. Rahim, 1999. An in vitro study on the anti-adherence properties of mouthrinses containing chlorhexidene gluconate and hexitidine. Ann. Dentistry, 6: 17-20. Jefferson, K.K., 2004. Mini review: What drives bacteria to produce a biofilm. FEMS Microbiol. Lett., 235: 163-173. Kreth, J., J. Merritt, W. Sni and F. Qi, 2005. Competition and coexistence between Streptococcus mutans and Streptococcus sanguinis in the dental biofilm. J. Bacteriol., 187: 7193-7203. Lagacé, L., M. Jacques, A.A. Mafu and D. Roy, 2006. Composition of maple sap microflora and collection system biofilms evaluated by Scanning Electron Microscopy and denaturaing gradient gel electrophoresis. Int. J. Food Microbiol., 109: 9-18. Li, J., E.J. Helmerhorst, C.W. Leone, R.F. Troxler and T. Yaskell et al., 2004. Identification of early microbial colonizers in human dental biofilm. J. Applied Microbiol., 97: 1311-1318. Listgarten, M.A., 1999. Formation of Dental Plaque and Other Oral Biofilms. In: Dental Plaque Revisited, Oral Biofilms in Health and Disease, Newman, H.N. and M. Wilson, (Eds.). BioLine, United Kingdom, pp: 187-209. Mah, T.F.C. and G.A. O’Toole, 2001. Mechanisms of biofilm resistance to antimicrobial agents. Trends Microbiol., 9: 34-39. Maiden, M.F.J., C.H. Lai and A. Tanner, 1992. Characteristics of Oral Gram-Positive Species. In: Contemporary Oral Microbiology and Immunology, Slots, J. and M.A. Taubman, (Eds.). Mosby Year Book, St Louis, pp: 342-372. Marsh, P.D. and M.V. Martin, 1999. Oral Microbiology. 4th Edn., Wright, Great Britain,. Palmer, R.J.J., S.M. Gordon, J.O. Cisar and P.E. Kolenbrander, 2003. Coaggregation-mediated interactions of Streptococci and Actinomyces detected in initial human dental plaque. J. Bacteriol., 185: 3400-3409. Rahim, Z.H.A., A.R. Fathilah, S. Irwan and W.I.W.N. Hasnor, 2008. An artificial mouth system (NAM model) for oral biofilm research. Res. J. Microbiol., 3: 466-473. Razak, F.A. and Z.H. Rahim, 2003. The anti-adherence effect of Piper betle and Psidium guajava extracts on the adhesion of early settlers in dental plaque to saliva-coated glass surfaces. J. Oral Sci., 45: 201-206. Singh, R., D. Paul and R.K. Jain, 2006. Biofilms: Implication in bioremediation. Trends Microbiol., 14: 389-397. Slots, J. and M.A. Taubman, 1992. Contemporary Oral Microbiology and Immunology. 1st Edn., Mosby Year Book, Mosby. Tait, K. and I.W. Sutherland, 2002. Antagonistic interactions amongst bacteriocin-producing enteric bacteria in dual species biofilm. J. Applied Microbiol., 93: 345-352. Watnick, P. and R. Kolter, 2000. Biofilm, city of microbes. J. Bacteriol., 182: 2675-2679.